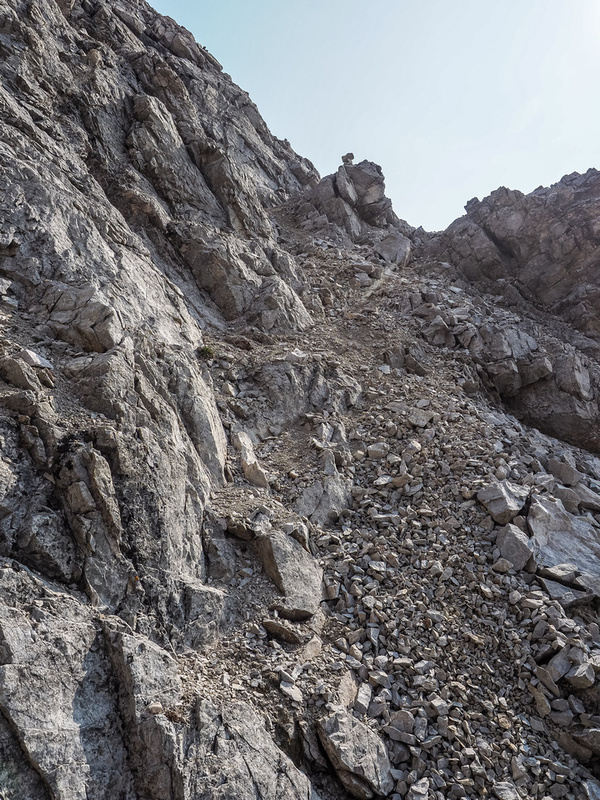 Difficulty Notes: There are a few moderate steps on the summit ridge that are “no-slip” zones but other than that this is pretty tame scrambling. 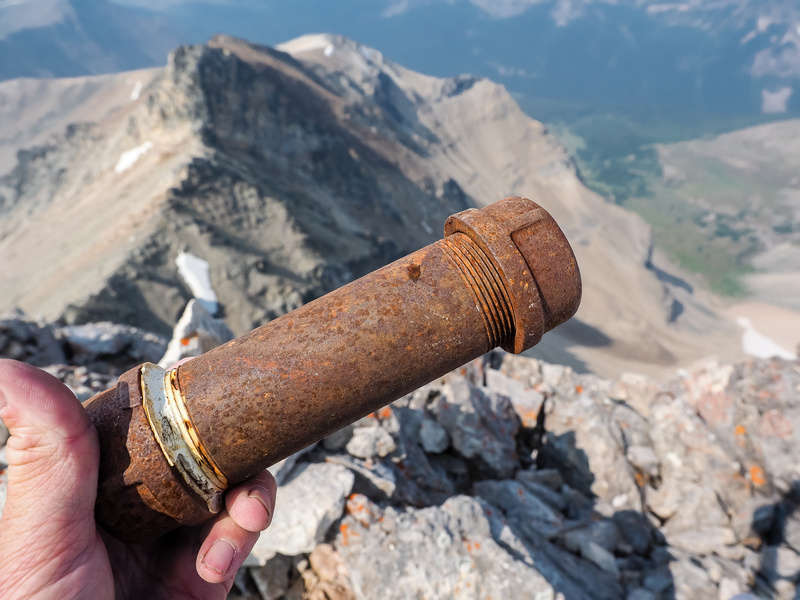 I wasn’t sure if I was in the mood for another peak as the August long weekend came to a close. I’d spent the weekend relaxing with family and was still feeling the effects of some pretty long days in the hills the weeks previous. 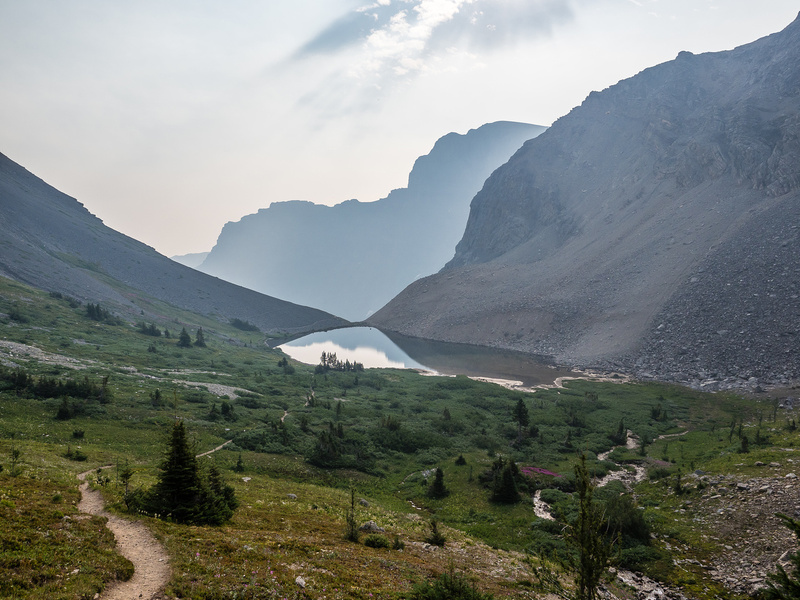 Thanks to wildfires in BC and especially in the Verdant Creek and Ball Pass areas, the air was also very smoky in much of the Rockies. But I had the Monday off and family stuff was done, so how could I realistically just sit there and not take advantage of another beautiful day in my beloved Rockies? Precisely. 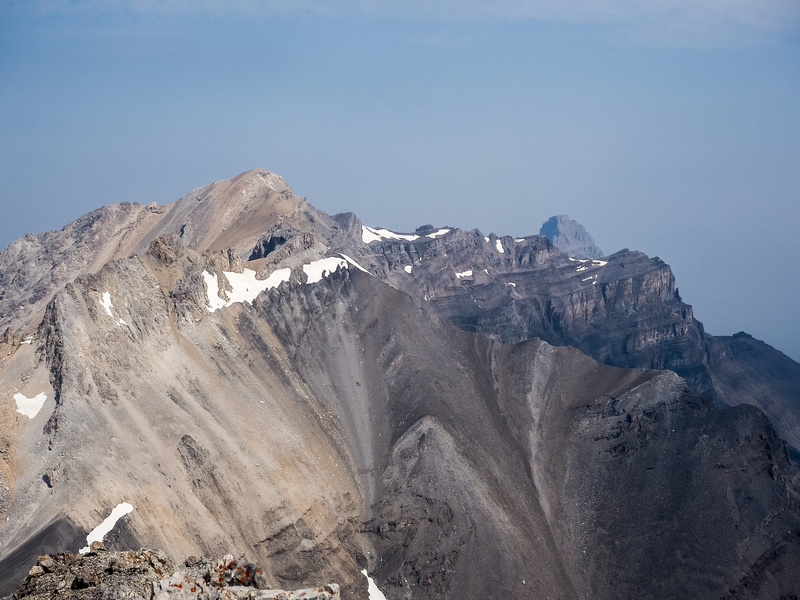 Originally my plans were to get up very early and finally bag Mount Ogden in Yoho National Park – this peak has been sitting on my list for years. I wanted to leave early so I could beat some of the long weekend crazies driving back to YYC in the afternoon. I woke up at 04:30 and promptly shut down my alarm and rolled over. This wasn’t going to happen today. 1.5 hours later and I was out of bed and backing the truck down the driveway. Yes – I have issues. What of it? Black Brett has intrigued me for a long time for some reason. Originally I heard about it when Parry Loeffer did it and posted something about it online (I can’t find it anymore). He indicated that it was difficult scrambling, but he had some snow on route when he did it. Years later, in 2015, Marka Stavrik did it and seemed to hesitate calling it “difficult”. Steven and I attempted it once already, but in a very rare turn of events, we turned back thanks to terrible weather once we got all the way above Harvey Pass. As I considered it, my mind was finally made up – I was going to give Black Brett another shot. As I got ready at the truck, I thought it was somewhat ironic that I’d settled on the mountain with the most height gain and longest of all the options I was originally considering. Even more ironic was the fact that it was the closest by far to the Verdant Creek wildfire and likely to be covered in thick smoke! Sometimes I think I need to try talking about my ideas out loud before doing them for real. 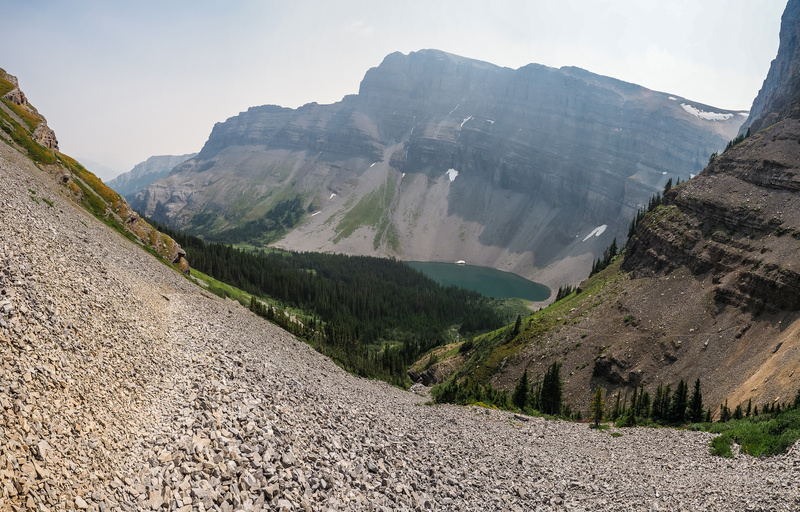 After briefly consulting a warning sign at the trailhead (fire closures), I started the long, hot march up to Bourgeau Lake. This approach is not only far, it’s also fairly boring, but it is easy and gains a ton of height before you realize it. I shut my mind off and powered up the trail setting a furious pace. 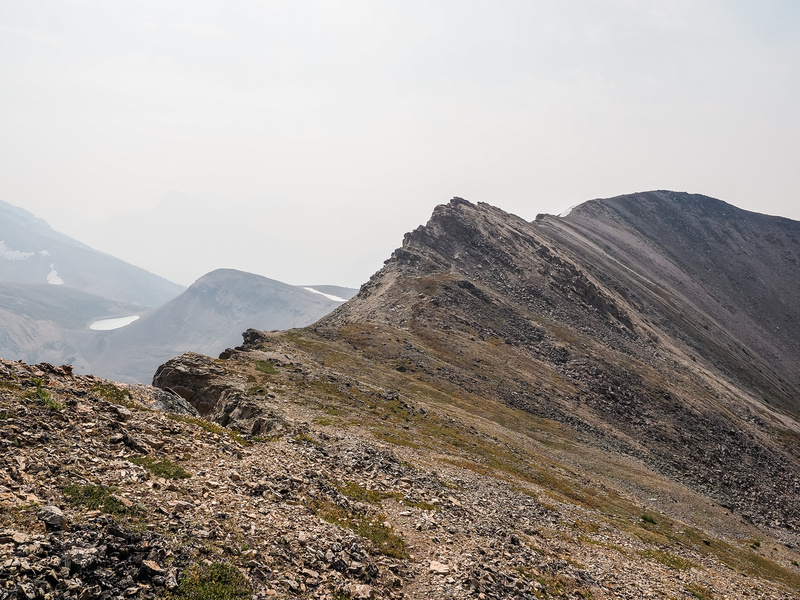 A hot, dusty approach as I start up above Bourgeau Lake towards Harvey Pass. 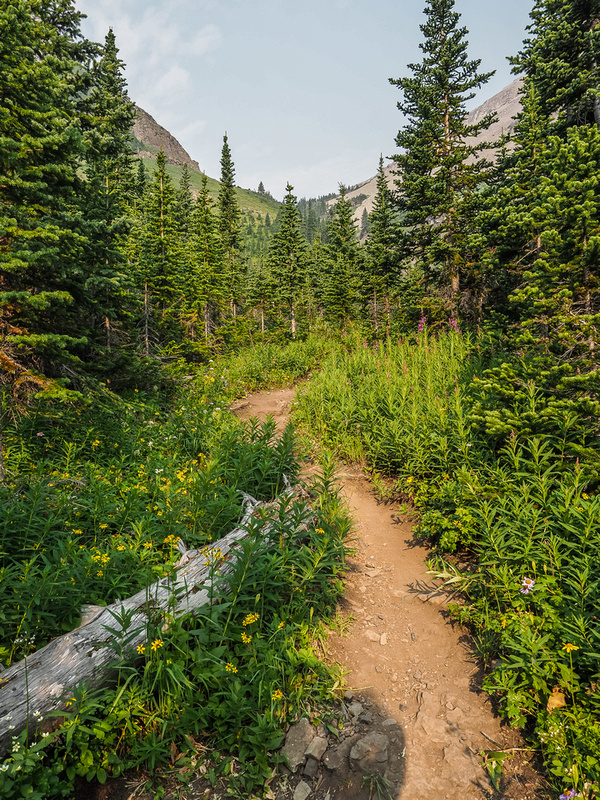 There weren’t too many folks ahead of me when I started at 07:45 but by time I was finally grunting up the final steep section of forested trail under the lake at around 09:00, I was at the very front of the pack – a fact attested to by the many spider webs I ate from that point onward. 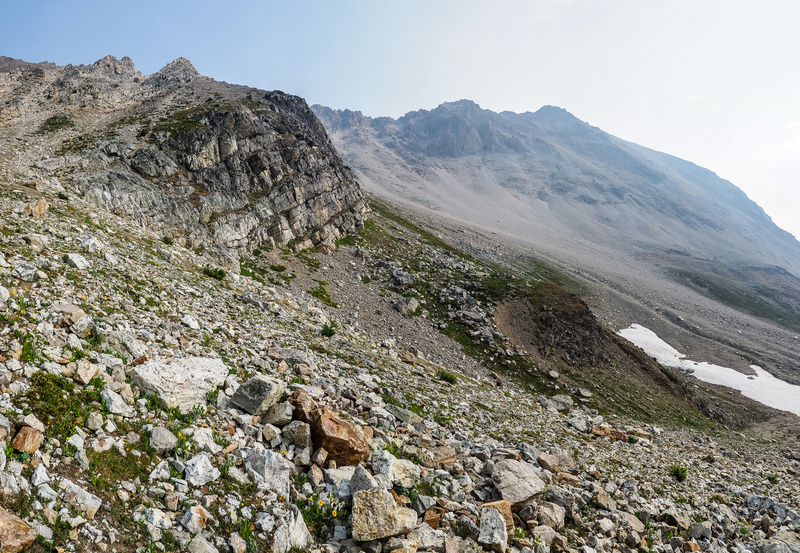 Despite all the hiking and scrambling I’d been doing already this summer, the smoke really started to bother me as I climbed steeply up the deep trail in the scree slopes above Bourgeau Lake. I could feel a tickle in the back of my throat and seemed to be operating at around 80% of normal. Oh well. 80% would have to do. 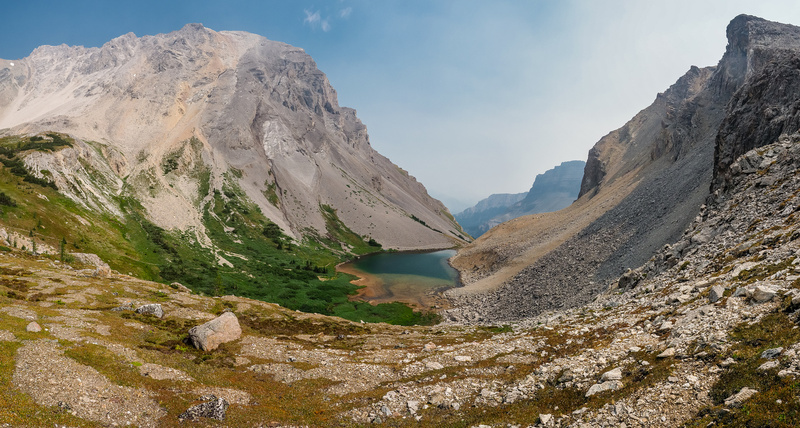 A view from the lower Harvey lake with the ridge running from Harvey Pass (L) to Black Brett (R). 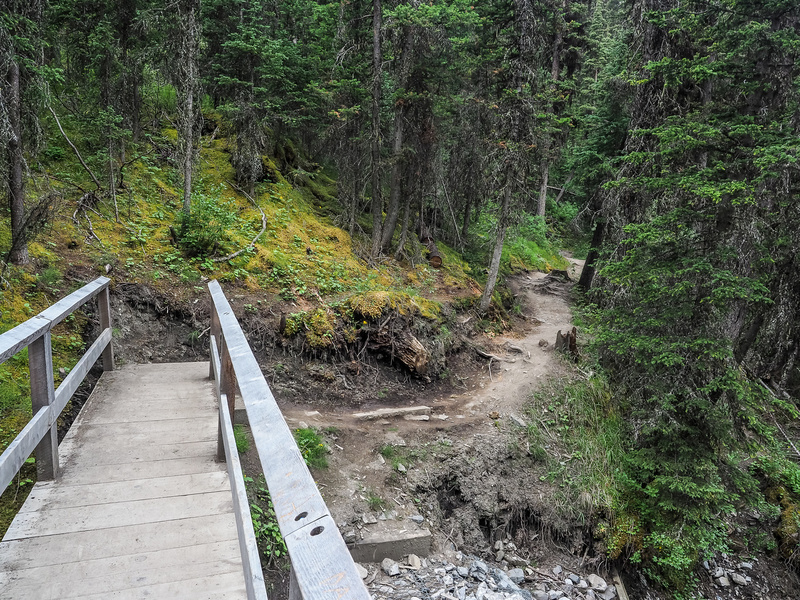 As I crested a steep section of trail to the shores of the first Harvey Lake, I noticed that Marko’s GPS track didn’t go to Harvey Pass as I was expecting. 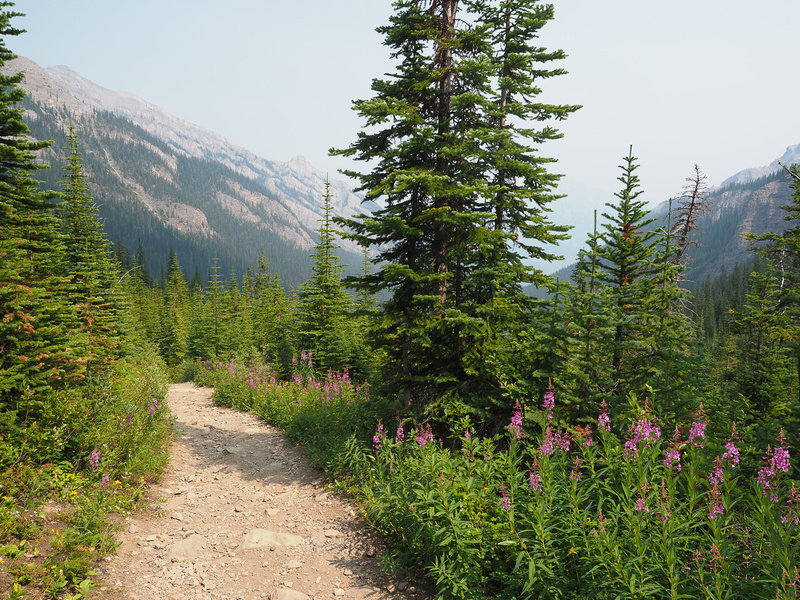 This was great news, as I now could see a clear route up from the alpine meadows NW of the two lower Harvey Lakes. This was a shortcut to the long section of undulating ridge from Harvey Pass to a high col, that I would no longer have to traverse. A clear line up a scree bench (I’ve been using a lot of “benches” lately) led to the upper south face of Black Brett, just under more complex terrain leading up to the summit. I set off up a cheerfully chatty brook, heading towards a large group of nonchalant sheep that looked at me sideways as I made my way silently and slowly past them so as not to disturb their breakfast. Looking ahead to the scree bench I used running upper left to middle above the darker shale cliffs. Black Brett out of sight at upper right. 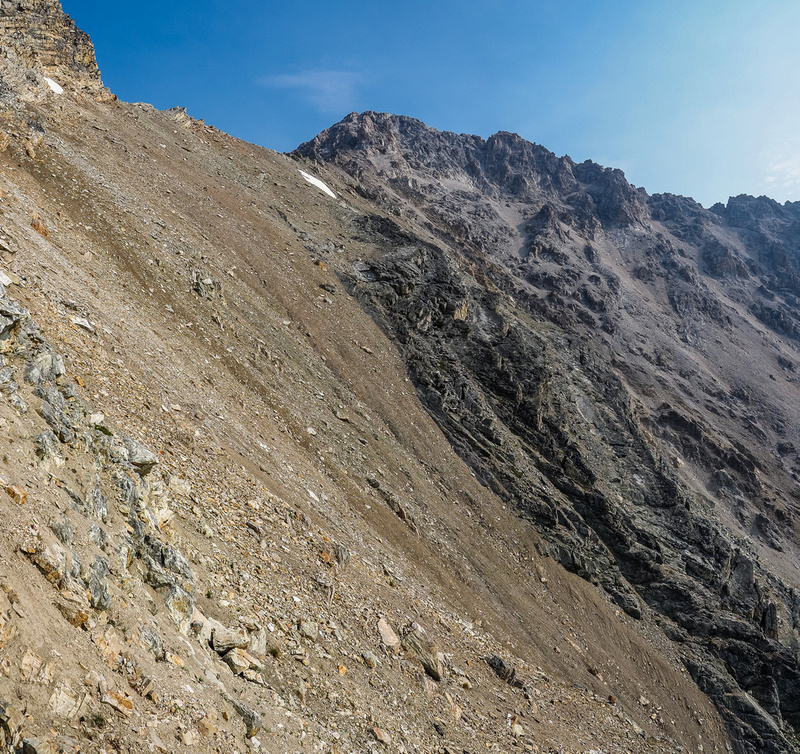 The scree bench was easy and quick and soon I was traversing a loose, almost sandy, slope to the col beneath the broken south face of the upper mountain. The traverse also went well, and was very easy terrain. From the col, I gazed up at the face, finding a line that looked pretty obvious and pretty straightforward, trending in a northeasterly direction traversing up and across the face to climber’s right. This is the key to keeping Black Brett fairly easy. It reminded me a bit of Commonwealth Peak where the terrain is complex and quickly gets difficult if you’re off route. As I contemplated some difficult terrain above me, I noticed a well-placed cairn guiding me up and further across scree and ledges to the NE. 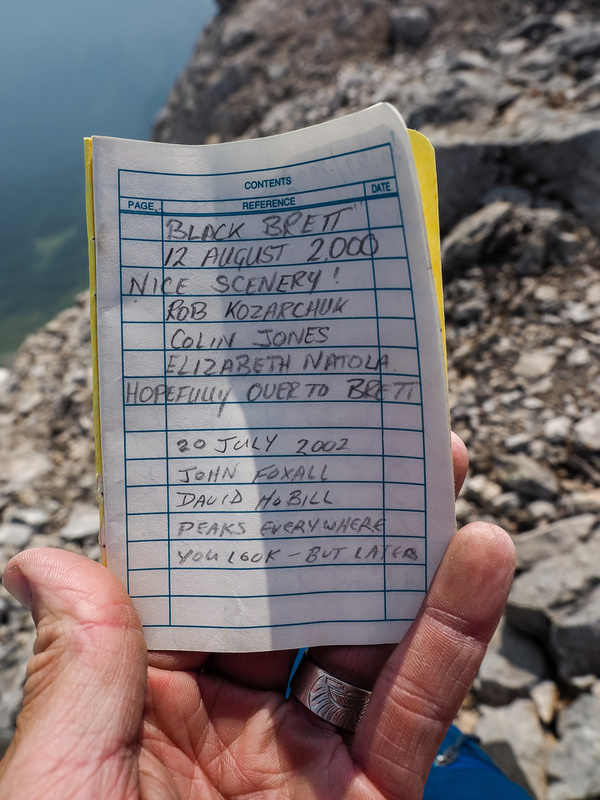 Again, this is the key to Black Brett – follow a line up and across the south face cliffs and gullies to the far SE ridge before cranking a hard left towards the summit. It was on meeting the SE ridge that the scrambling got a bit more interesting. Still fairly easy but with some pretty severe exposure down the NE face to my right. It was easier going up than down, but still only moderate scrambling at most. 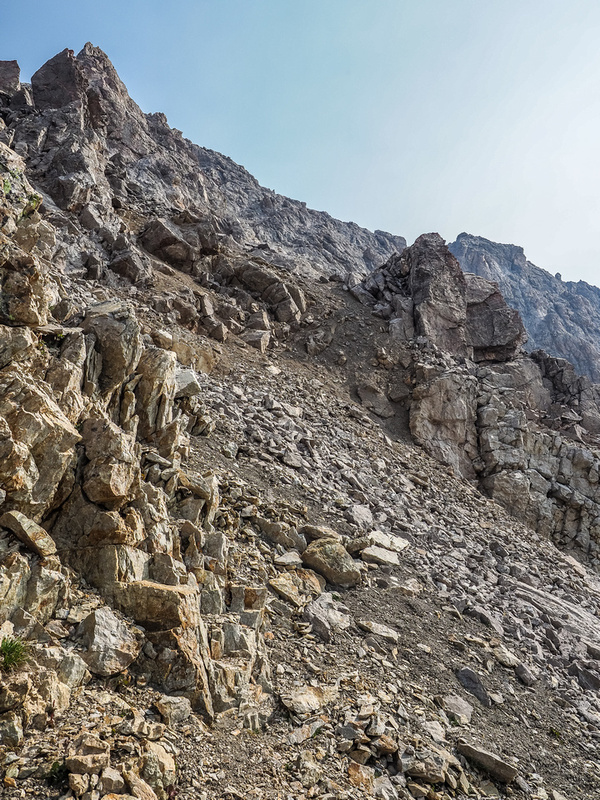 As I followed the solid ridge to the nearby summit, I could see why anyone ascending the south face would have a much harder time than the route I took. The register hadn’t been signed since Marko did it which surprised me a bit. Black Brett likely has better, or at least similar, views to Bourgeau and is shorter and more fun scrambling. Of course I only got hints of the views, as I was buried in a layer of smoke. I enjoyed a few minutes at the top in perfectly windless, warm conditions before turning my attention to the descent. 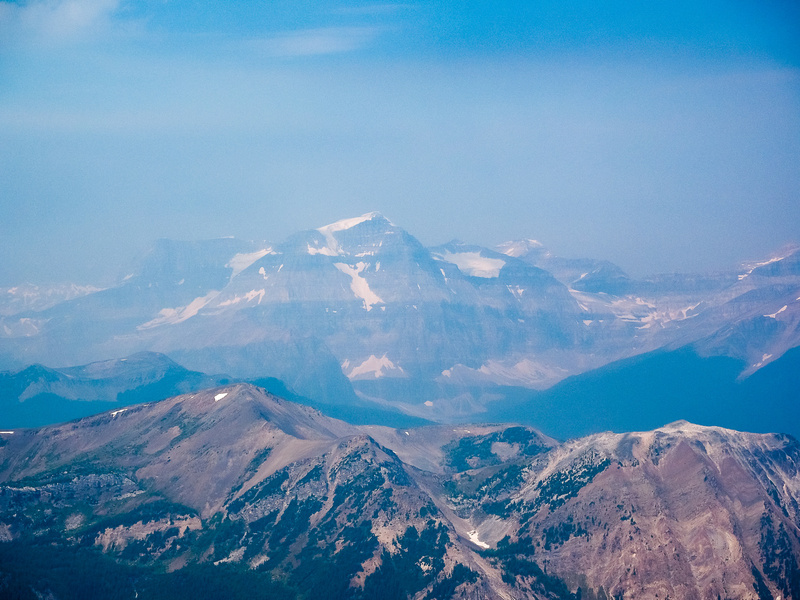 Great views through the smoky haze back down the SE ridge towards Mount Bourgeau at right. Views to the west and north to Mount Brett from the summit. Another view down the SE ridge with Harvey Pass at right and Mount Bourgeau rising ahead. 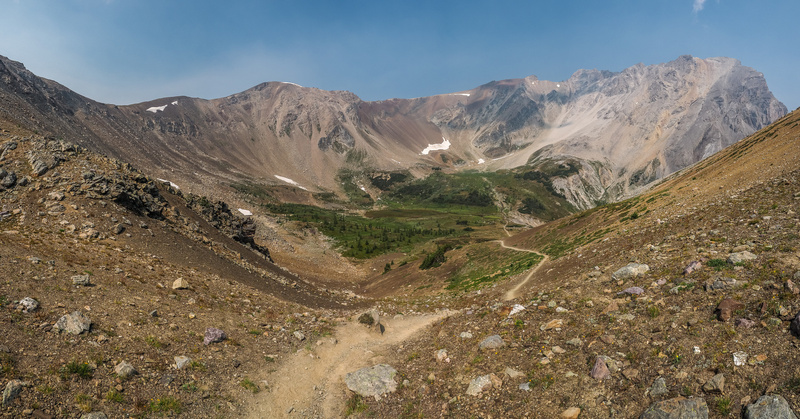 Since I was only at the 3 hour mark when I arrived at the summit of Black Brett, I figured I might as well take advantage of a gorgeous summer day and try descending via Harvey Pass rather than my ascent route which would likely have me back at the truck within 6 hours of leaving it! No sense rushing things too much on such a nice day. 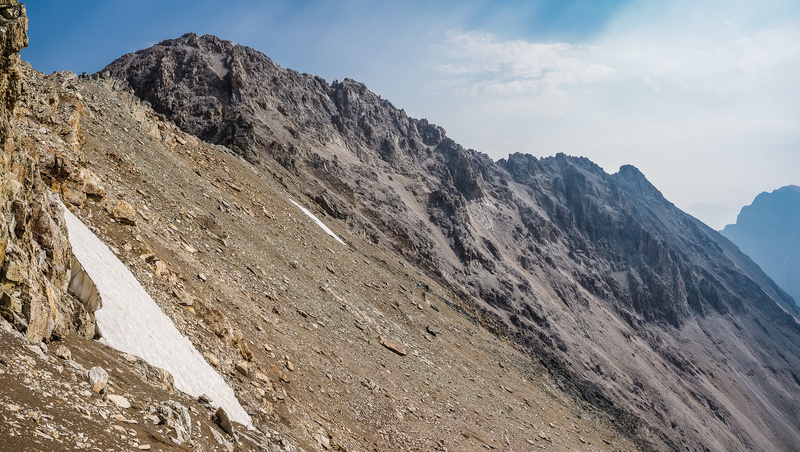 I made my way down the SE ridge crux (some exposure on a short, moderate step) before retracing my way across the incredibly loose SE face towards the col and the pinnacle blocking the ridge towards Harvey Pass. From the col the view towards the Pinnacle is much more intense than the hiking, which goes around everything on the left. Looking back along the ridge towards Black Brett – I’ve come a long way already. The pinnacle was easily circumvented on it’s SE side on loose scree. From there it was a pleasant hike along an undulating, wide ridge towards Harvey Pass. The smoke was a real shame as this is likely some of the best views in the area. 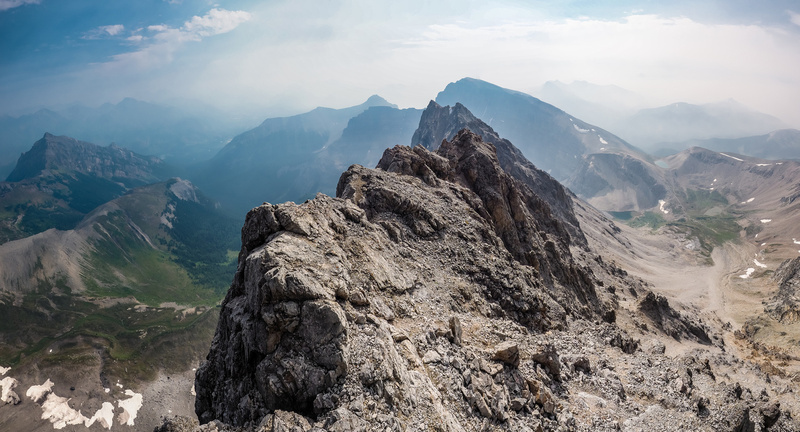 I know that I’ll be back on this ridge in the fall sometime when the smoke finally clears. As it was, my views were somewhat dreamy in nature and not awful – just not as clear as the scenery deserved. 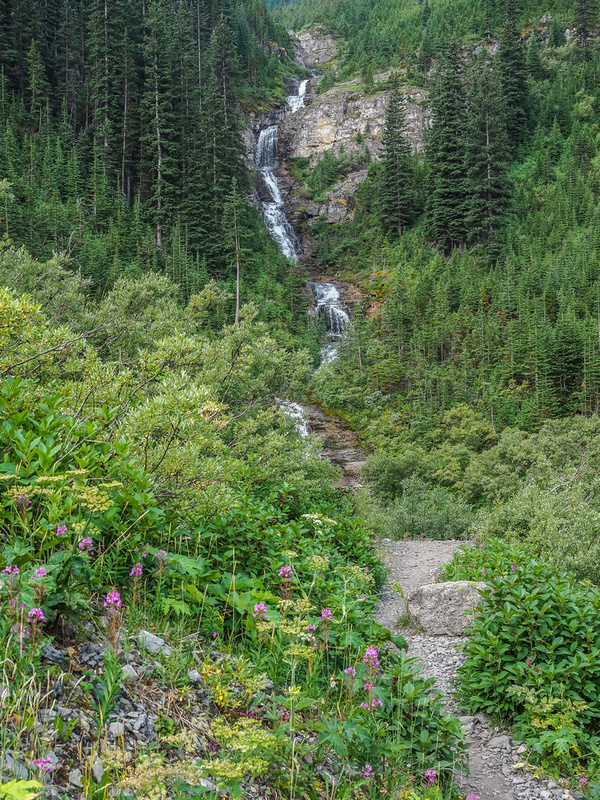 I enjoyed a fast descent to the pass before starting my way down the long trail to the parking lot. Great view over lower Harvey Lake. I passed less people than expected on the descent – maybe 30 or 40 – considering it was a long weekend. The restricted parking at the lot and the smokey air probably had something to do with it. 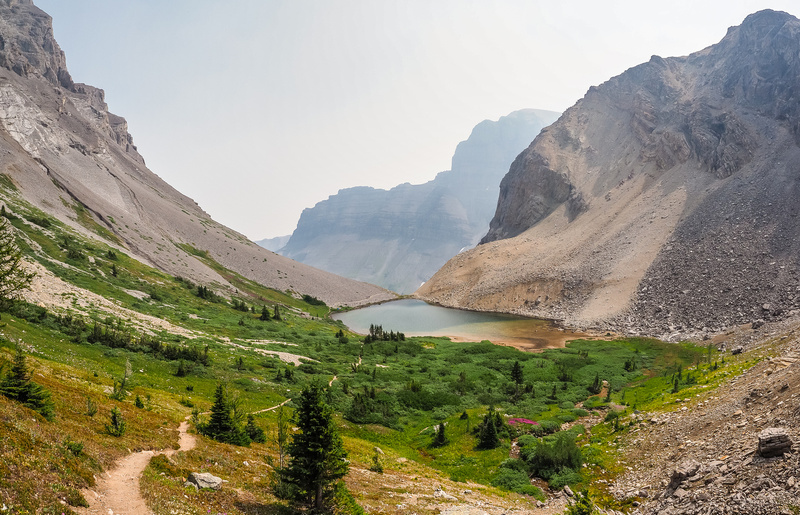 Bourgeau Lake is also not the shortest or easiest hike in Banff. I was surprised to arrive back at the truck only 6.5 hours after leaving it. 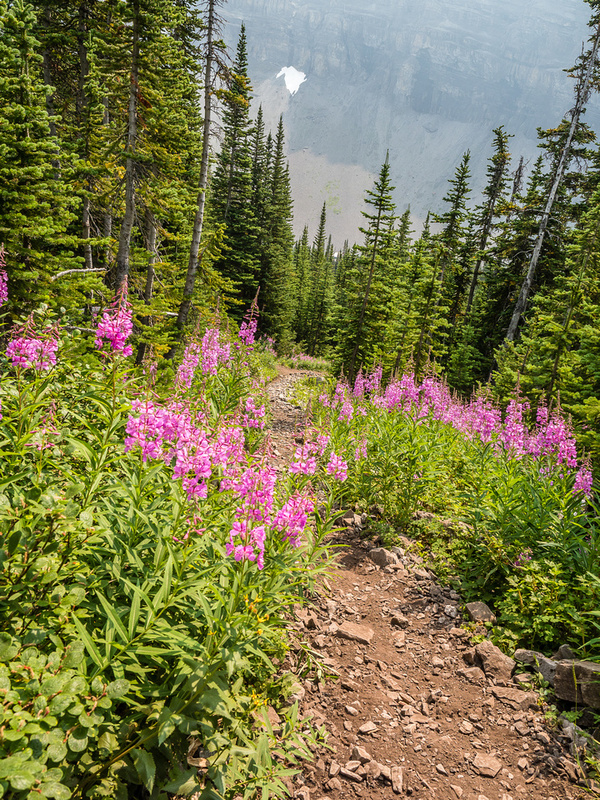 Brilliant wildflowers on the way down to Bourgeau Lake. 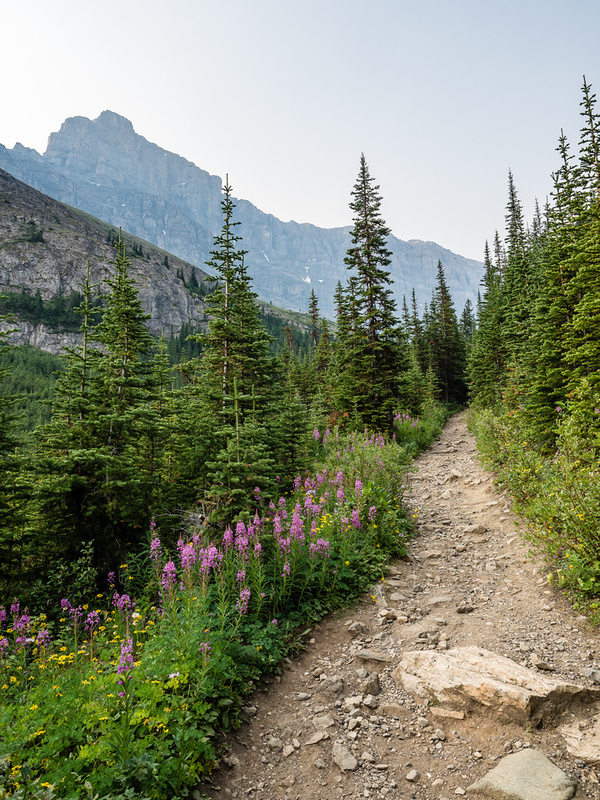 The stats for Black Brett aren’t short at over 1500m elevation gain and over 20km with the Harvey Pass loop, but most of it is on either a well-defined trail or easy terrain which helps to make this more of a half day than a full day outing. Of course, pushing myself hard in the smoke was a bad idea as I’ve had a nasty summer cold the whole week afterwards and am still not completely recovered as I type this up. It's going to be another hot summer day! A bridge that had to be rebuilt after the 2013 floods. 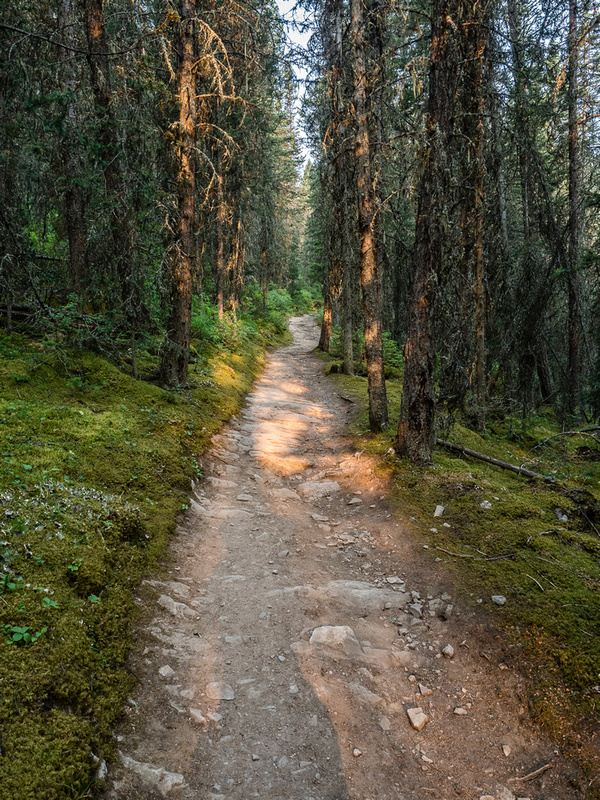 Smoke brings out the vibrant colors around the trail. Haze in the air as I approach Bourgeau Lake. 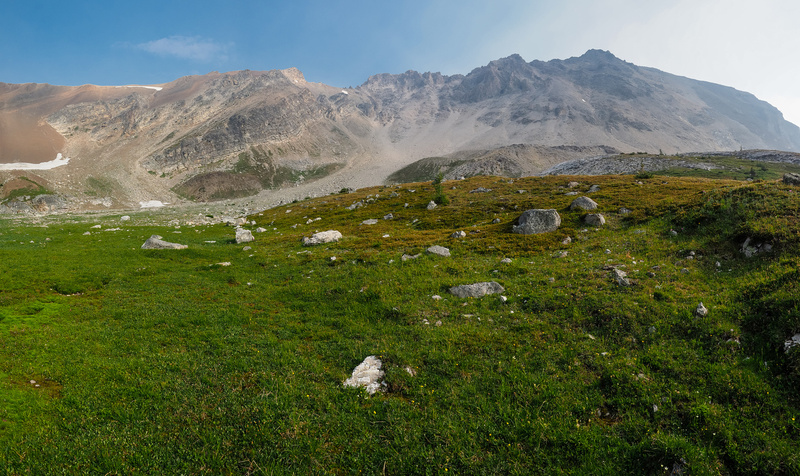 The meadows before Bourgeau Lake with an outlier of Black Brett at center. 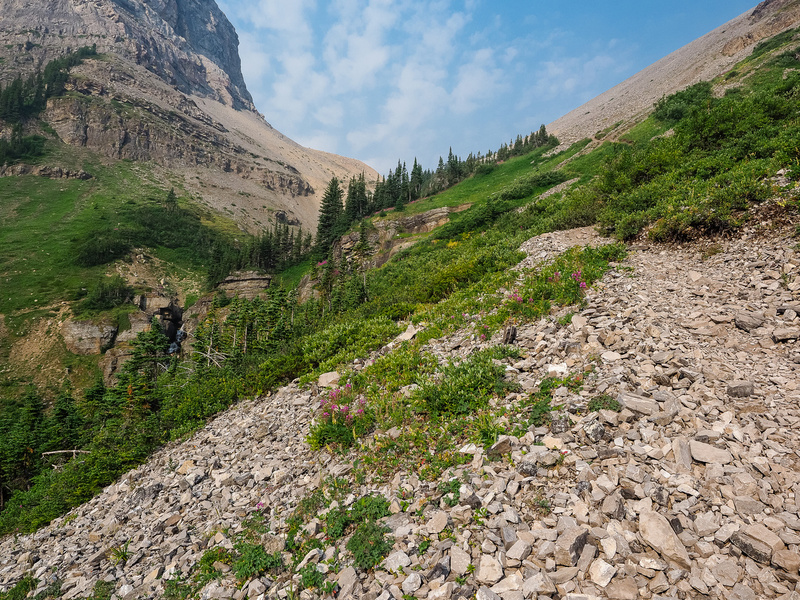 Ascending the steep scree slopes past Bourgeau Lake. Looking back over the lower Harvey Lake. Off trail now, looking towards my route with Black Brett at upper right of center. Click for approximate line - very foreshortened here. Looking up the easy bench. 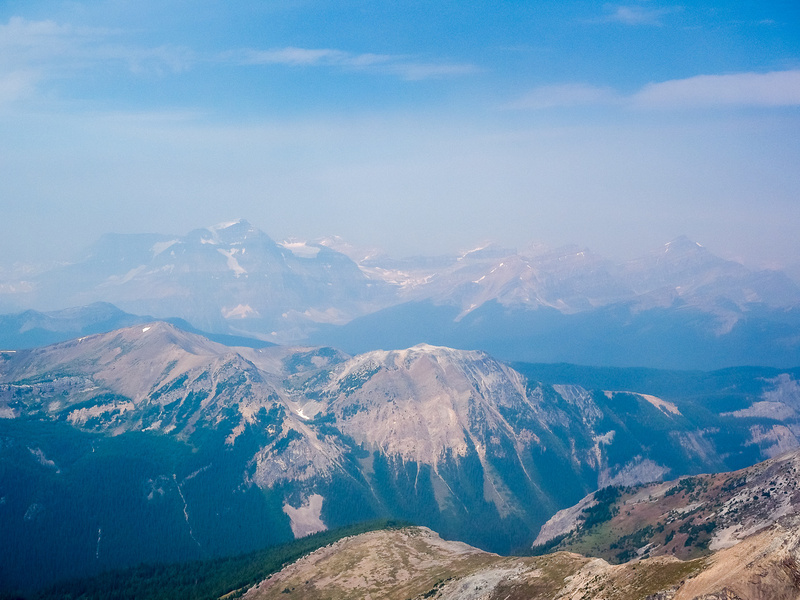 Nearing the col, looking back at Mount Bourgeau (L) with Harvey Pass left of center and the three Harvey Lakes barely visible in the smoke. The reason it's called "Black" Brett becomes obvious as I cross the loose, dirt slope towards the SE face. Note the obvious (and fairly easy) line continuing along the face. Left is difficult, right and up is easiest. A very well placed cairn (that seems to last through the years somehow) keeps me from going left too early. Views along the SE ridge towards the summit. This is not a busy register with at most an ascent every two years. Looking over Mount Brett towards Pilot Mountain just visible at right. A slightly wider shot towards Ball, Stanley and Storm (L to R). 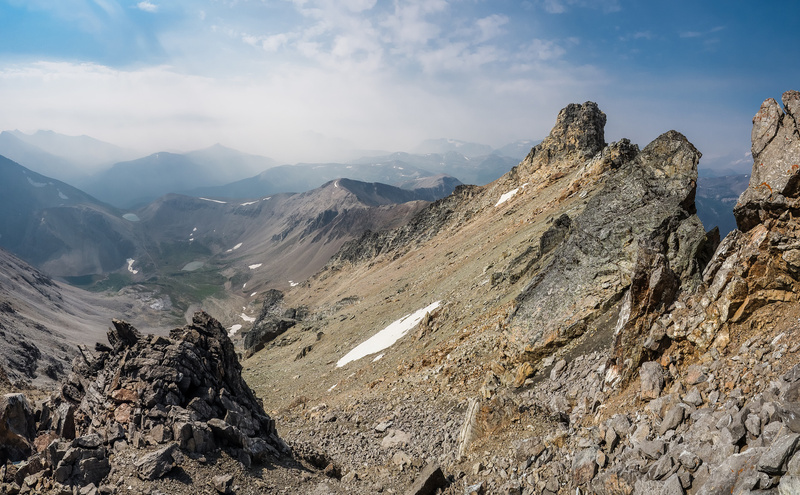 Panorama from Harvey Pass (L) to Mount Brett (R) looking south and west. Another view looking down the SE ridge from just on top of the short crux. The crux is this short slab section on the SE ridge with some exposure down to the right. Looking back from near the pinnacle at "Black" Brett. 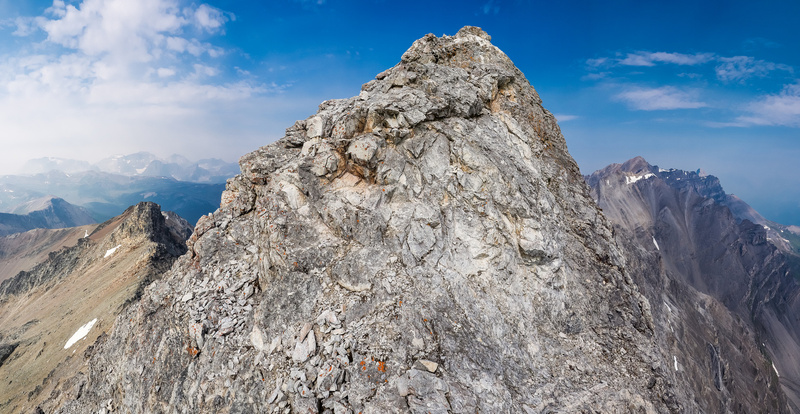 Traversing under the pinnacle is easy terrain. The ridge undulates a bit, but nothing too dramatic or tiring. Looking back along the ridge towards Black Brett - I've come a long way already. 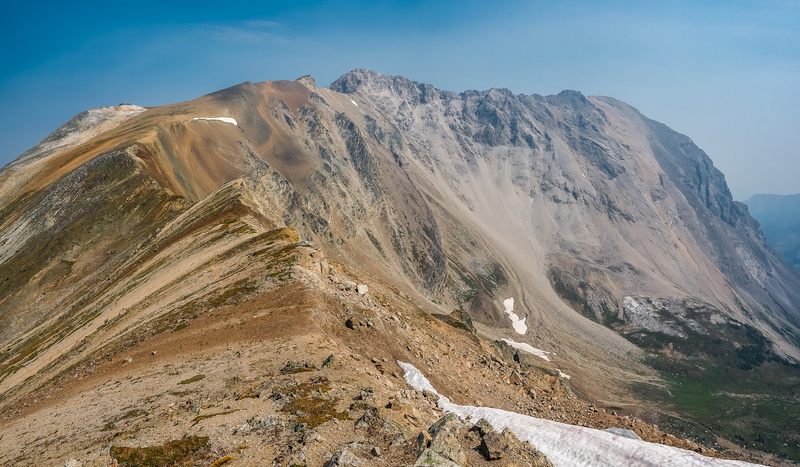 A great shot showing the entire ridge from Harvey Pass (R) to Black Brett (L-C) with Harvey Lakes in between. 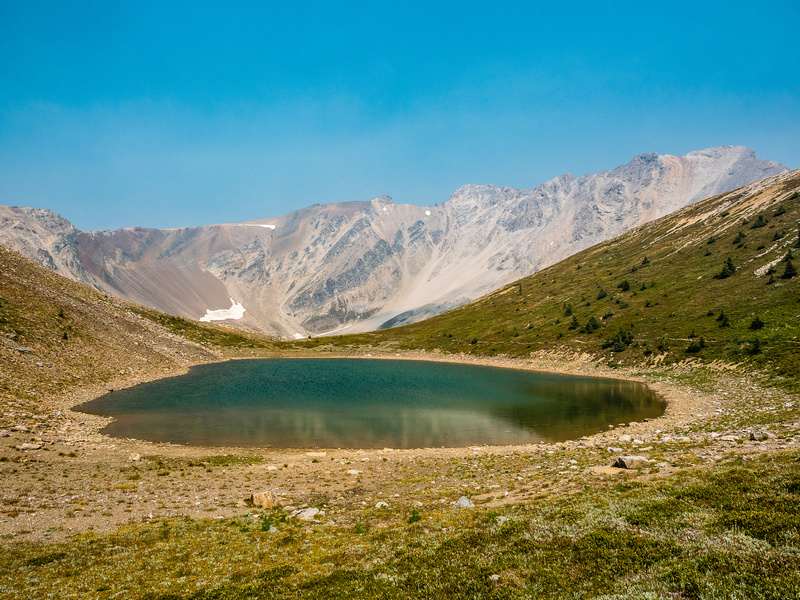 Harvey Pass and the upper Harvey Lake. Brilliant wildflowers on the way. The long trek back from the lakes.